Fixing a Beeper Signal from an EC-47? 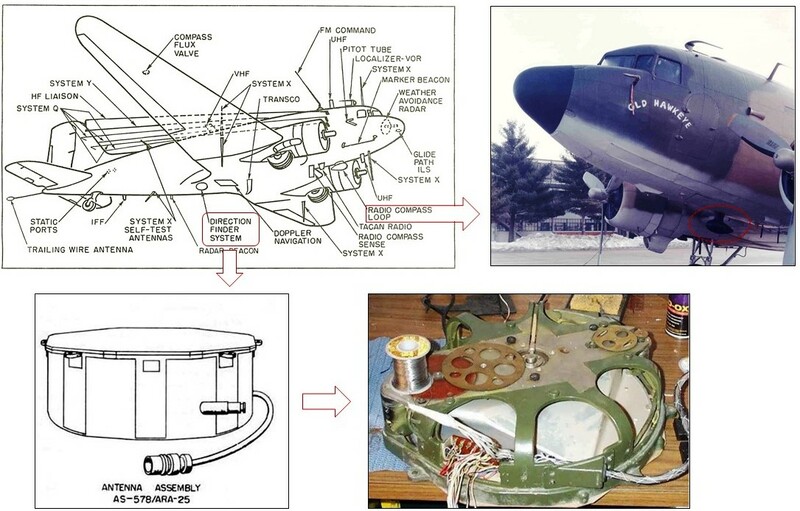 Both the 360th TEWS and the 6994th histories describe fixing a beeper signal on 31 January 1967. The 360th narrative goes into considerable detail. At 1620 hours on 31 January 1967, while engaged in a routine reconnaissance mission in their assigned area, a Phyllis Ann crew, Dragon 94, received an emergency beeper signal over UHF Guard frequency. Using ARDF procedures in establishing lines of position, the crew fixed the exact location of the beeper signal as 18 miles west of Phan Rang. They immediately notified Phan Rang Air Base tower who dispatched a rescue helicopter (Pedro 44) to the scene. Dragon 94 then established contact with what turned out to be a downed helicopter #868. Proceeding to the downed helicopter, Dragon 94 observed red smoke flares and a red panel marking 868' s position. Orbiting over the downed helicopter which was under hostile enemy fire, Dragon 94 directed Pedro 44 in for rescue pick-up. Sidewinder aircraft (armed Huey helicopters) arrived in the area to provide cover and to suppress hostile fire. At 1650 hours, five persons were observed to have been picked up by Pedro 44. An additional five persons were rescued by 1700 hours. A total of only forty minutes had elapsed from the time Dragon 94 first received the emergency beeper signal to when all personnel in the downed helicopter were recovered. The quick rescue of these personnel were attributed to the outstanding professional skill of the Phyllis Ann crew. These downed personnel might not have been otherwise timely rescued and consequently might have been subjected to capture or hostile enemy action. The back-enders queried agreed (and tech docs confirm) that the AN/ALR-34 or -35 systems could go nowhere near VHF range, much less the 243.0 channel for UHF guard. Since reporting of these SAR efforts predated the introduction of the VHF-capable ALR-38 system, something other than the X console ARDF equipment had to have been used. According to the “Dash 1”, the EC-47 had two separate navigational radios which, if coupled with aircraft location derived from the Doppler, could’ve been used to generate at least a rough fix location. The first of these was the AN/ARN-7 “Radio Compass” of WWII (or earlier) vintage—which could not home in on VHF or higher frequencies. However, the more modern AN/ARA-25 Direction Finding System was designed for just such applications. The figure below illustrates the non-ARDF direction finding antennas on the EC-47. The position of the aircraft was updated continuously by the Doppler. Coupling the azimuth of the beeper signal as indicated by the AN/ARA-25 with the aircraft’s location as shown on a Doppler print-out, the location of the emergency signal could be plotted in the same manner, if perhaps with less accuracy, as an enemy transmitter. At least that's how we figure it. 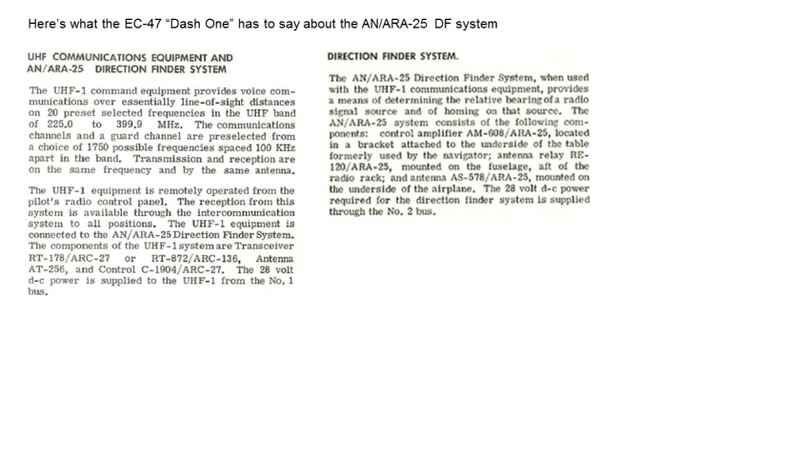 (Click here to view the relevant EC-47 "Dash 1" notes.) What say, former navigators? *The TEWS history for the same period makes no mention of this incident, and no U.S. aircraft losses on this date from which crews were recovered are listed in available sources. 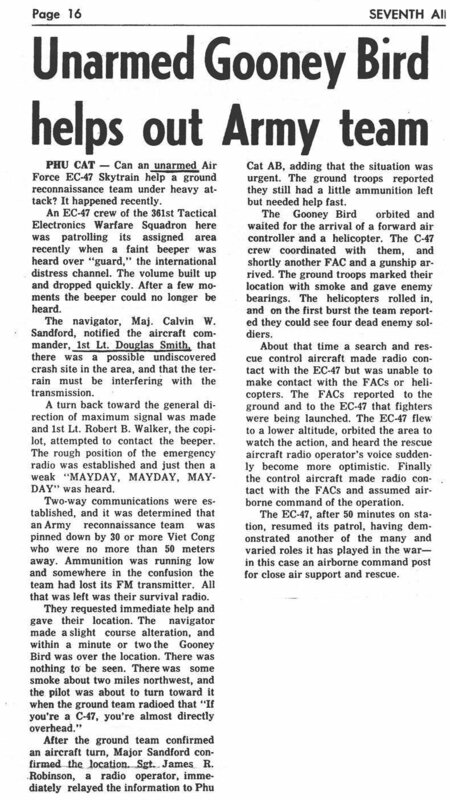 Another beeper-fixing incident, this one concerning an army patrol in danger of being overrun, appeared in 7th Air Force News, date as yet undetermined. The article was relayed by Bill Hollenbeck via 6994th.com. Click here to see the clipping. I spent three years in ACR (Aircrew Recovery) in Vietnam (out of Danang, as it were) before going back as part of the 362nd. Any USAF aircraft, including the EC-47 has the capability of cutting a line to a VHF or UHF signal. Those radios were under the pilot's control and could feed "needles" in the cockpit which would give you A plotting line. This could be treated just like any other plotting line -- and, after some separation it could be crossed with a line from a new position. Two lines give a tentative location. Three lines make it pretty good, and the more lines you have the better (more accurate) is the position. You should know that the radios are capable of determining the line, plus or minus a couple of degrees which is plenty good enough. The other method (used by rescue) is to simply follow the line until the needle switches direction -- you just passed over the source. I can get a lot more detailed, but there is no reason to doubt the ability of the Goon to locate a survivor. Check out your EC -1, pp 4-13, 14, for description and operation of the UHF/DF system. It was a different D/F setup from what y'all used in the back of the EC. UHF D/F was through the UHF comm radio in the cockpit, and the pilot/s would have to use it. It worked just like the same setup we used in the KC-135 for checking the receiver's offset from the tanker when doing a point-parallel rendezvous. Anyway, it was only through UHF #1 (copilot's radio didn't have the DF capability), and when the Comm 1 switch was held in the DF position, the pilot's RMI bearing indicator would swing to indicate relative bearing to the transmitting station--the receiver aircraft during air refueling rendezvous, or a survival radio in the referenced situation. The bearing pointer would indicate only as long as the sending transmitter was keyed (probably had to be brief in SAR situations so the bg's couldn't home in on the location of the downed crew). Both radios would of course have to be tuned to the same freq. For air refueling, it would be the UHF primary A/R frequency; for SAR, it would be 243.0 (UHF Guard). The system was strictly direction-finding only, and indicated relative bearing to the transmitting UHF. It didn't have any DME capability, so distance was a guess, but LOP convergence could give the nav a fairly good position reading. Hope this helps. Merry Christmas!